Sports Technology has been helping referees and official at major events and tournaments increase their accuracy with correct calls as this Newark/Electronic 14 Infographic about “Technology in Sport” – helps to show. The Sports Techie community blog readers may remember our launch during the 2010 South Africa World Cup when FIFA had no goal-line tech in place and it cost England dearly against Germany on an obvious blown goal call. Our contribution for Intel covered the implementation of goal-line technology during the 2014 FIFA World Cup and other sports tech. 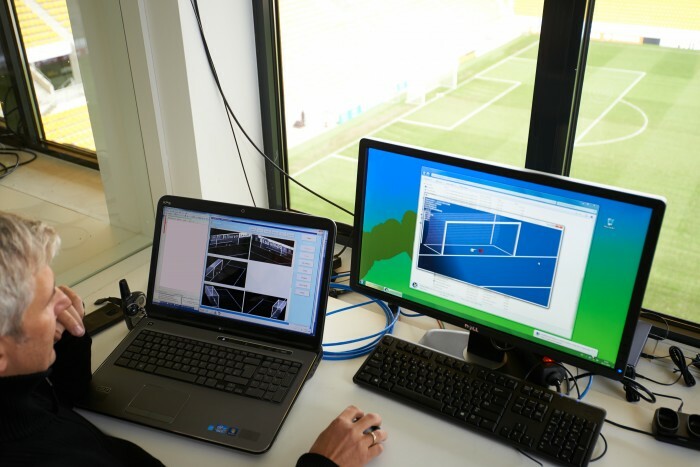 Advance technologies used in sport, such as Hawk Eye and Goal Control GLT that were used in several of the latest sporting events such as World Cup Brazil and Wimbledon, are now an integral part of the game and strategy, as well as a valuable computer driven assistant ref or official. To error is human. Our gratitude for sharing this image, facts and data goes out to: http://canada.newark.com. Sports Techie, Wimbledon, the Ashes and the Barclay’s Premier League have pioneered sports tech as have the U.S. Open, and the World Cup. International matches and major Clubs have also done their part to ensure that refs have the right kind of digital help when needed for calls and rule interpretations. I snicker at the leagues and their executives who have said the costs of sports tech systems, solutions and products are prohibitive when they collect hundreds of thousands to millions of dollars in profit for business organizations and institutions who are often non-profit. As much as I love to squeeze the good ol’ boys who run FIFA for their tech-phobic operations highlighted in Brazil by missed offside calls, poor judgment on penalty kick placements and unsportsmanlike conduct situations, they did get GLT right by implementing GoalControl. It was used several times during the world’s biggest and grandest tournament and I applaud them for making sports tech history as a result. Here in the United States, it has taken over a century for Major League Baseball to integrate instant replay into the game. Why it took so long is a long list of factors such as the maturity of technology, cost and the stubborn umpires union, but in the end, it is now in play with a central New York City HQ used for all replays, as is done in the National Hockey League for all goals scored. The humans who actually run the Challenge system for MLB are proving to be slow to review the video and reverse calls that are made on the field by umps. My feeling is they need to be replaced with younger sets of eyes who can handle the video rendition speed and make the appropriate decisions, regardless of how much an ump might pout. The NHL has very little problem with verifying goals, high-sticks and other questionable penalties are next on their agenda. The National Football League have given instant replay power to on-field officials who are influenced by what I call the “lawyerism” of sport, meaning in this case if it is not irrevocable evidence; they are mandated to not overturn a call, even if it means the call is wrong on the field. Look for the NFL to move all replays to a central location in NYC soon. There is still the massive issue in football from NFL to NCAA of spotting the ball correctly, locating the proper first down line, and whether made or missed field goals and extra points, happened. A laser line would easily take care of this for the better of the sport, an improved in-stadium fan experience, while adding to a more interactive TV and mobile device broadcast. The big issue in the National Basketball Association is the interruption of “gameflow” when reviewing instant replay calls. It can take as many as 5-10 minutes to review a three-point shot or goaltending call. One thing for sure, the NBA and college basketball administrators need to immediately stop allowing coaches to use instant replay breaks like a called timeout. Keep the players on the floor away from the coaches until a decision has been convened. Every sports tech product can and should be sponsored. If I was advising a Fortune 500 or startup company on marketing “best practice” I would emphasis the ROI garnered from a unique sports tech sponsorship as the way to go rather than be one of 25 or 50 sponsors at a venue or during a television broadcast. Being the sponsor of the” first down laser system” would be a landmark opportunity for the right company be that in the automotive, financial or technological Industries, or any other Industry who wants to be more effective with branding. Bottom line, bravo to the Federations, leagues and sport events that have the proactive vision for over a decade now to help fund, test and secure the rights to game changing sports tech products that improves the refs, the games and the fans experience, as well as generate revenue for users. Augmented reality technology in the not-so-distant future is coming next.